Navigate: StoreFront / Supplies for Earth Bottom Ponds & Lakes / Step #2 - Natural Bacteria/Enzyme & Muck Treatment / Pondzilla Pro - Breaks Up Floating Pond Scum & Algae plus more! Pondzilla Pro - Breaks Up Floating Pond Scum & Algae plus more! Pondzilla works by reacting with dead plant matter in a water body and converting it to simple sugars. These sugars are then uptaken by beneficial bacteria. Pondzilla utilizes the latest in enzyme technology to degrade 30%-60% of pond muck at one tenth the cost of physical cleaning. Pondzilla helps clarify water and degrade muck and sludge in lakes and ponds by activating the muck layer and stimulating bacterial activity. It contains surface-activating agents, that liberate pond muck and allow the active ingredients to speed up nature’s natural decomposition cycle. It works particularly well in ponds with filamentous problems. Use in combination with VitaStim MD Pellets (See Related Products below) for a optimum control of algae & muck. Applicators like it because it cleans up the muck and sludge. They get called out to clean up plant material and have to tell the customer, “I cannot kill dead.” PondZilla accelerates the decomposition of plant debris. For ponds that receive a lot of leaf matter, this is a good way to break them down. Leaves from soft maple and fast growing trees tend to degrade better than pine needles and leaves that are high in lignin (oak leaves). If leaves are already decomposed Pondzilla will help degrade them further. If leaves are fresh, Pondzilla will not complete the degradation over the course of a summer. Pondzilla also degrades pollen from pine trees, cottonwoods or others. Pondzilla is very effective, when also used as an adjuvant to an algaecide or herbicide application, at controlling algae in ponds. While bacterial and enzyme products cannot kill aquatic plant growth alone, when used with algaecides or herbicides, they can help restore natural balance by quickly breaking down the dying weeds into sugars that the beneficial bacteria consume eliminating the need to physically remove dying plant material. What is Pondzilla & what does it do? PondZilla is an activator, penetrant and cleaning agent developed from catalyst technology which helps to polish a lake or pond. Pondzilla works by reacting with dead plant matter in a water body and converting it to simple sugars. These sugars are then uptaken by beneficial bacteria and released to the atmosphere as a harmless gas. 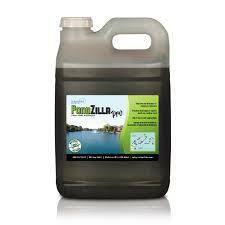 PondZilla can also be tank-mixed & applied with algaecides/herbicides at a rate of 1 - 2 gallons per surface acre . NOTE: PondZilla Pro does not kill algae, however, it does break it down and makes it more susceptible to algaecides and herbicides. 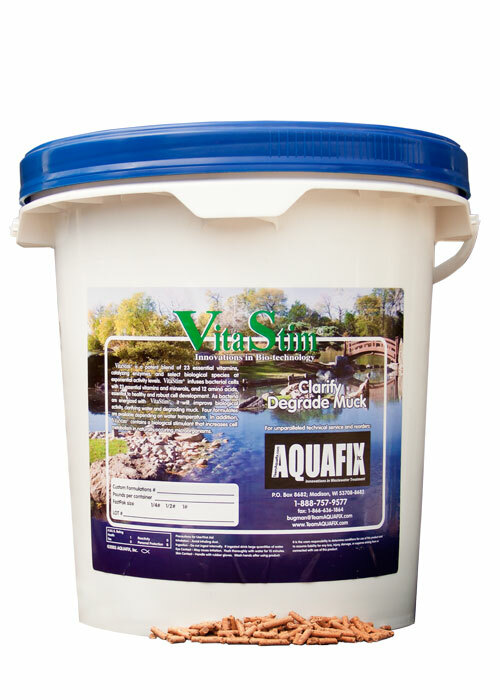 Apply maintenance treatment amount 2 weeks after initial application and then every 2 weeks until pond is clear. NOTE: Always dilute Ponszilla to proper application dilution. Disperse evenly & not exceeding maximum listed application rate. Failure to dilute, disperse evenly, or exceeding application rates may cause fish mortality by diluting the available disolved oxygen levels. Aeration is strongly recommended whenever you use any products to breakdown excess organics in a water column.